Who’s a bad little fluffums? Bad kitty! Look what you’ve done, Snufferlumpapaws. Look at this big mess you made! 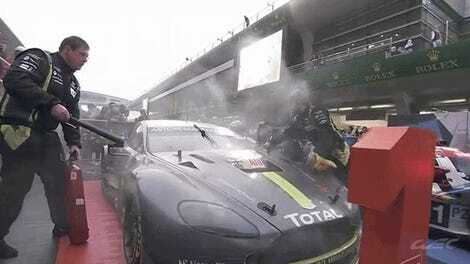 You briefly yellow-flagged the season finale of the world’s highest rung of endurance sports car racing. Bad, kitty, bad! Bad! Bad! 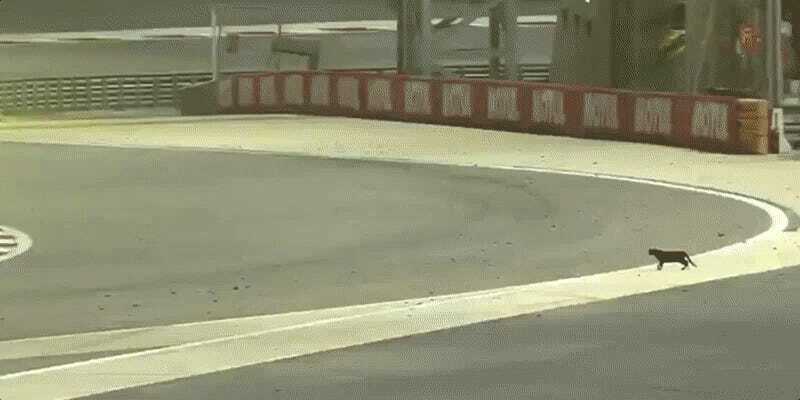 Puffball McTeenyboots’ on-track adventure forced officials to call for a yellow caution flag on the World Endurance Championship’s 6 Hours of Bahrain today, making sure they slowed down and paid attention so Little Snookums didn’t become impromptu ballast before he wandered back off the track. This is way worse than destroying the couch in the media center, Little Snooflepaws. Much worse than ripping open the sack of damaged LMP2 bodywork and using one of Jackie Chan DC Racing’s boxes as a bed. I can’t believe you, cat. Can’t. Believe. But. But. Who’s a good kitty? D’aww, look at this good kitty with his twitchy nose and floofy tail. I can’t stay mad at the cat. The cat doesn’t know not to interrupt the cars. Also, cats are adorable. Teeny weeny adorable Sweetietail was successfully cleared from the track and has not come back on. The yellow flag was called off when officials saw Little Pufferbelly making a beeline for that great litter box of the racing world, the gravel trap. The No. 8 Toyota TS 050 continues to lead the race with just over three hours to go. The leading LM GTE Pro car, the No. 92 Porsche, just turned in to with the No. 8's sister No. 7 car, taking the No. 92 out of the lead and beaching it in the gravel, and forcing the No. 7 to come into its garage for repairs. The No. 51 AF Corse Ferrari now leads LM GTE Pro. UPDATE [12:57 p.m. ET]: WEC commentators noted that Fuzzy Longbottoms here was safely captured by a veterinarian. UPDATE [1:47 p.m. ET]: In a bizarrely late call, the No. 7 was called in to serve a stop and go penalty with 18 minutes to go over its contact with the No. 92 Porsche. You know, from last place in the LMP1 class.